First and foremost, insure your machine. An OMAX waterjet is not a cheap item. For many businesses, their waterjet is their livelihood. Please make sure that in the event of a catastrophic event, you will be able to recoup costs and restore your machine properly. 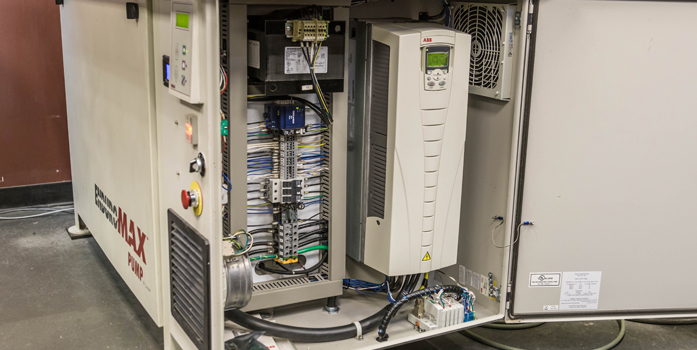 Use your facility’s Lockout/Tagout procedure to securely disconnect power from the pump. Remove the covers and visually inspect the pump’s condition. Clean out the white charge pump tank on OMAX/EnduroMAX pumps. Clean out the RO System Holding tank on MAXIEM machines with an RO. Change the oil in the pump’s crankcase as water may have entered through the breather tube. Disconnect and blow out all hoses in the system – both internal and external to the pump. Remove and inspect/replace all filters from their housings. Clean out any residual water and blow out the input and output lines. Clean and dry the internal components. A large fan is often used to dry out wet equipment. Change the cabinet air filter. There may be dirt and debris inside of components including the VFD. This needs to be fully cleaned out. The electric motor may be full of dirt and debris also. It may require a certified motor shop to disassemble the motor and clean it properly. IntelliTRAX rails and beams – wipe down the linear feedback tape and sensor readhead surface. Electronics that are inside the bridge uprights – remove the covers to find power supplies, servo cards, etc which may need cleaning. Table Control cabinets often house computers, power supplies, servo cards, and other electronic devices. These will need to be thoroughly dried and cleaned. Change the table control cabinet air filter. Once all the electrical components are readied for power up testing, close and secure all the doors and upright covers. Once the pump and electrical cabinets are cleaned and prepared for operation, reassemble everything, close and lock the electrical cabinet doors, turn on the OMAX pump without the main feed energised, then turn on the main feed. CAUTION: There is potential danger in doing this as there may still be dirt and debris remaining that could cause a short circuit, either blowing fuses or tripping the circuit breaker.